The story of Alice in Wonderland is turning 150 this year. Lovely Sara from Made by Sara had a brilliant idea to celebrate this event and invited a few sewing bloggers to create something - anything - inspired by this wonderful story. I think in images. Once I am given a challenge, a series of images start flicking through my mind until a right image kind of pops out from among the rest. This challenge was no different. It felt like before I knew it I had four images of things I could make shape up in my imagination, and let me assure you choosing one was not easy! While she was sleeping, I made an Alice in Wonderland inspired dress for my daughter. OK, I can practically see a few eyebrows raised wondering how this dress could possibly be inspired by the story. Nevertheless it is! The story of Alice in Wonderland has become classic, it will never lose it's appeal. It really is timeless. 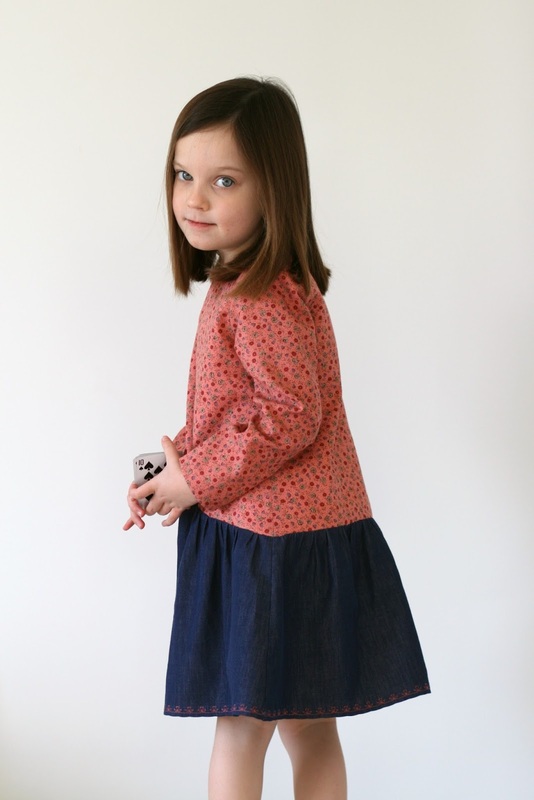 I chose the Tiny Mice Dress pattern by Puperita for this project because of its classic, timeless feel. 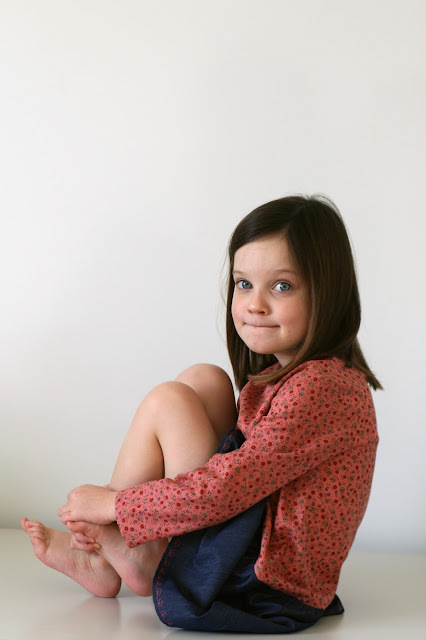 I have already used this pattern to make a dress for my little niece. The pattern has options for short or long sleeves. The instructions show how to fully line the dress. I decided to only line the bodice, so I had to change the construction method which was very easy to do. 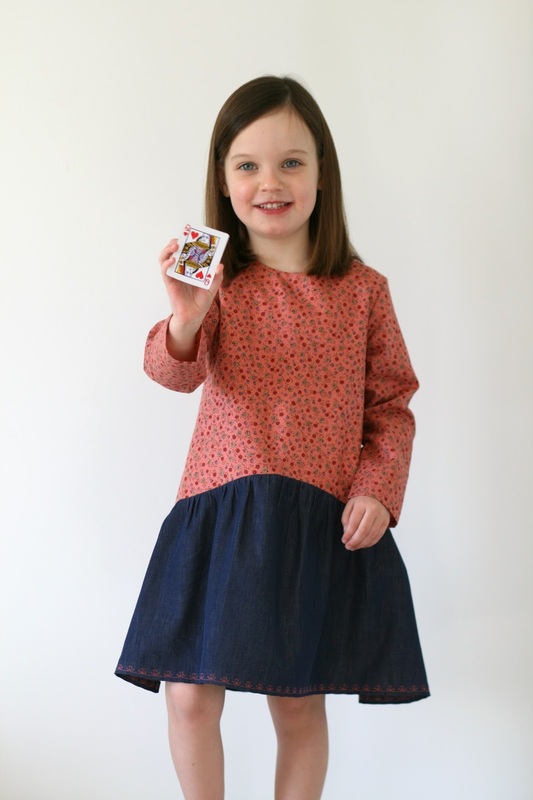 My daughter is tall and slim so I cut size 4 with size 5 length bodice, and size 4 with size 6 length skirt. I also lengthened the sleeves a little. I absolutely love the way this dress fits her! While the story of adventurous Alice is old, each new generation of readers falls in love with it. So old and new were my two other clues. For this dress, I combined vintage printed cotton and new denim chambray, both purchased from a fabulous local fabric shop House of Cloth. 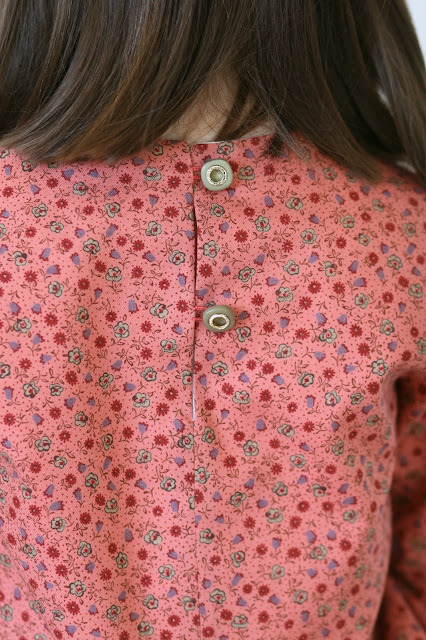 It took me just about forever to decide if I wanted to keep the original buttons and loops closure on the back of the dress or use a zipper instead. While I had a green zipper that matched the roses on the dress perfectly I decided to look through my buttons. I am so glad I did as I came across two vintage (old, yeah?) buttons that I felt were perfect for this project. Fancy stitches to the rescue! My sewing machine has a number of flower motifs and this is what my young assistant chose. I think I should use fancy stitches more often! I absolutely love the effect they added to this dress. So, this is R's new Alice in Wonderland inspired dress. When I showed it to her she said, "It is awesome!" Please visit other participants of this wonderful series to see how the story of Alice inspired them! Sara also put together a wonderful giveaway that runs 13-25 July. Two lucky winners will receive seven patterns each! I totally agree with her, it is awesome! 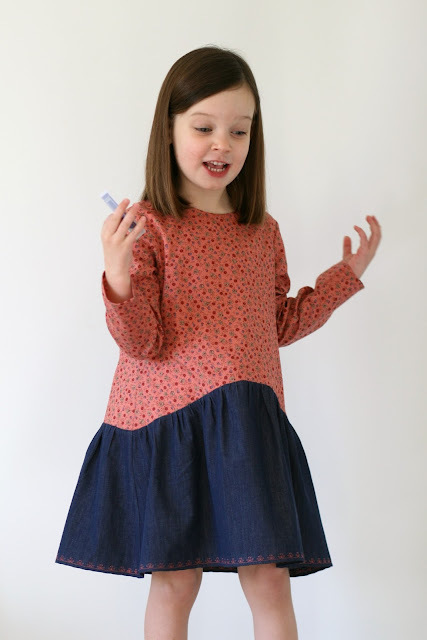 :) I love the playful shape of the dress and your fabric mix is perfect! That is SUCH a beautiful dress. WOW!! The fabrics and colors are amazing and that hem detail....swoon!! And your daughter is beautiful! Way to go! My girls are always admiring the fancy stitches in my machine too. They look great in this dress ... Totally inspired me to give them a go. 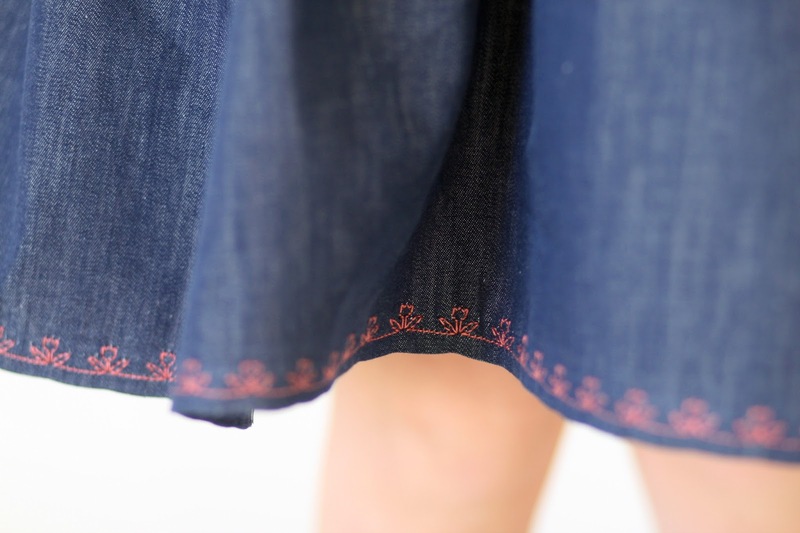 I adore that stitching along the hem of the denim. It's beautiful! That is a cute dress! I love how everyone is using inspirations but not making costumes. And this dress is so cute and very wearable. The decorative stitches is beautiful and just the perfect touch! Thank you Annie. Your Alice inspired dress for Momo was awesome! While I admire dress ups made by someone else, I stick to 'boring' everyday outfits. 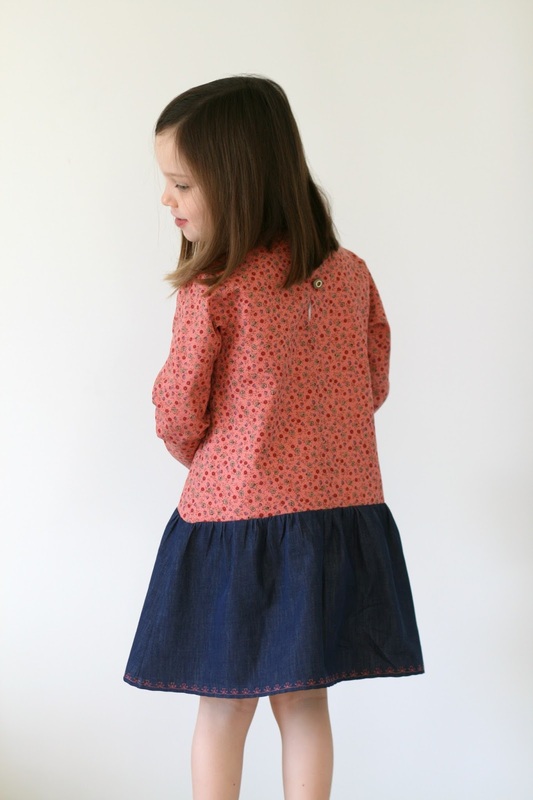 I am trying to sew a little ahead of time and make something my daughter can wear now as well as during spring when I might be too pre-occupied with a new little person to sew for my big girl. The dress is so beautiful and your daughter is striking! I agree, fancy stitches for hemming are fun! I think the dress is awesome, too, Jenya!!! I love your machine embroidery on the denim. I've done it a few times now and am always happy with the result. Thank you Pam. I love the way the embroidery looks on denim! Definitely more fun than my original idea (just a pink straight line haha). Love this dress Jenya! 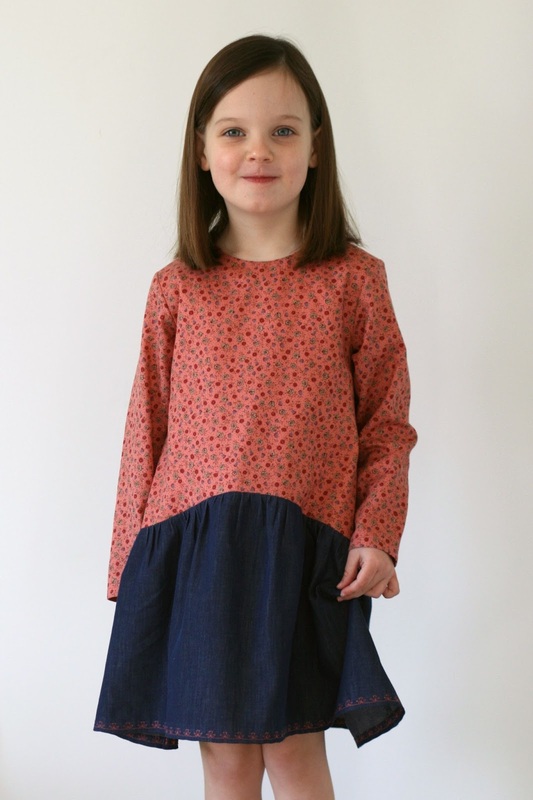 The fabrics really look great together and your daughter is beautiful! <3 Loved your interpetation on the theme. Jenya! This dress is so lovely and your daughter look amazing. The mix of the denim and that floral fabric is so good! also the machine fancy stitch is great. My machine have some, I should try them some day. What a sweet dress! And I especially love the final picture! Thank you very much :) That last pic has a bit of a story behind it. You see. my daughter is not the most agreeable model. That's what she did when I asked her to show me the front of the dress! In being a little rebellious model she looked so cute I just kept on clocking the camera and ended up with a few shots I would have never dreamed of staging, ever! Love this dress! I've never seen this pattern company but I love the silhouette of the dress and what you did with it. Really well done!